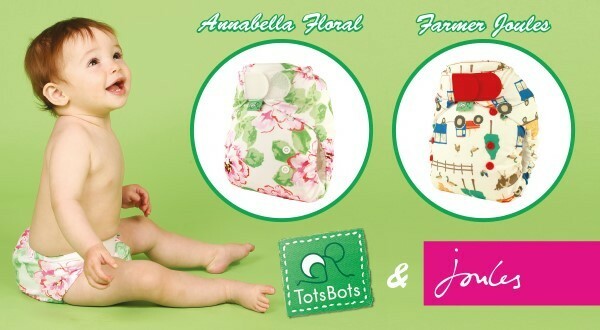 We are absolutely fluffed to bits to announce our print design collaboration with none other than the fabulous Joules. Bursting with British-ness, these two new prints are the perfect addition to any cloth nappy stash! It all began when the lovely people at Joules paid a visit to our factory, where we manufacture products for Joules for our friends Cheeky Chompers. They were so impressed with what we were doing here that thus – a collaboration was born! Annabella Floral: A beautiful, bright floral design, with pink in too! Something we don’t normally do at TotsBots but we think it’s bloomin’ lovely and are sure you will too! Farmer Joules: The best selling farmyard print, featuring tractors, cows and ducks is sure to be country-wide hit for busy little cloth bottoms. So! Much excitement and rosy cheeks all as we kick off this farmtastic summer launch. Are you ready to join in? Follow our launch activities on Facebook, Twitter and Instagram and remember to enter our collaboration competition with Joules and Cheeky Chompers!